One WWI Navy and Marine Corps USMC Purple Heart Award Medal. Has "FOR MILITARY MERIT" on the back. This one is in used condition with wear on the front and back of the medal. This one has been worn a lot. 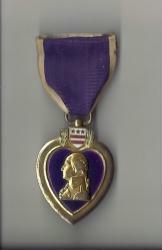 I believe they refer to these as the Type 1 Purple Hearts as they were some of the first ones made. Has the split brooch pin assembly on the back.